Storm Winds Incredible Win at Whiteside County Fair! Stormy is the most aggravating animal I ever owned and trained. He has plenty of speed and an incredible want to win attitude – but he just can’t stay on the trot. I am about at the point of giving up on him as I can’t think of anything else I can do to help him, I even loaned him out to see if someone else could catch something I could not see. 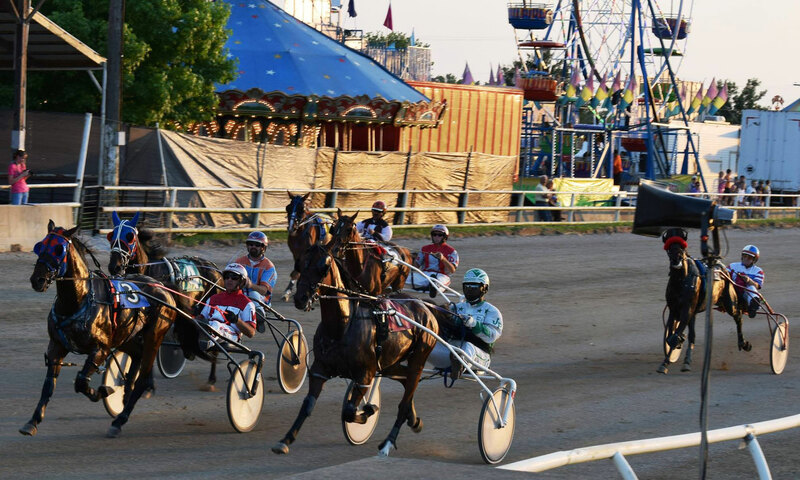 I raced him in the Illinois State Fair and he broke stride in both the elimination and the final, my driver told me that it was time for me to accept what he is and quit; and I had to agree. But at the same time due to the draw schedule of the county fairs I had already entered him into the fair in Whiteside County at Morrison Illinois. I knew there were only three horses in his race, so being guaranteed third I decided that I would take him there anyhow. It was a miserable rainy day and the track was bad and Stormy was in the ninth and last race. We thought they were going to cancel twice due to the downpours and the track was starting to come up a bit. We call it cuppy because he horses hooves flip up the dirt like a teacup would shoveling sand. The ninth race came on the track at about 3 in the afternoon and the three horses went to the gate for the last race of the fair, Stormy had the three post. It was a good start for Stormy, which 60% of the time is not a claim he can make, and he got away from the gate on the trot. Gary Rath was driving and he filed into line third behind the other two horses. As the horses were leaving the first turn on the way to the quarter Stormy did what I expected, he made a break and galloped. I kind of shook my head and began to really accept that I needed to find him a new home. When the leader reached the quarter pole Stormy was 3 lengths behind and at least he was back on the trot, so it looked like I would not be too embarrassed from his effort. As he swung i nto the straight past the grandstand the first time he did it again breaking into a run… now as the leader reached the half in a very fast 1:03.2 Stormy was now 13 lengths back but back on the trot. As the horses go through that next turn they disappear for a bit behind the judges stand and a group of trees, so the first two horsed emerged and the were separated by about 5 lengths… after a long enough pause that I thought maybe he fell down or was pulled up from the race I saw Stormy come into view. …And he was MOVING! I thought to myself, WOW is he flying and for certain he will break again on the backside straightaway. The straightaways are his bane, he is totally backwards from most as he can fly through a turn but struggles on the straights. But he did not break, he appeared to be accelerating. The leader hit the 3/4 pole in 1:37.3 with a 25 length lead ahead of Stormy. For those not used to some racing “physics”, a length is equal to about 1/5 of a second – so Stormy was at least 5 seconds behind the leader. When Stormy hit the far turn it was pretty obvious he may catch the second horse – and the grandstand started erupting in cheers. It started as a low rumble and grew. We aren’t used to racing anymore with fans in the grandstands. Computer wagering and all the other entertainment options have really affected our sport – so hearing people cheer was pretty moving. This county fair had a good crown in their old grandstand – maybe just a place to hide from the rain and eat a corn dog; but they were all getting into the race. Stormy flew past that horse in second and it started to seem possible he could catch the leader. The leader hit the stretch 2 seconds before Stormy with a 10 length lead. Stormy was still coming with the velocity looking to be in his favor… EXCEPT this was now in the stretch, about 1/8 of a mile of straight, muddy, cuppy dirt… With the crowd screaming Stormy passed the leader with about 100 yards to go…. THEN HE BROKE AGAIN…. Luckily Gary grabbed him up and got him back on stride to record a two length win. I guess I will keep him a few more weeks, maybe something in his walnut sized brain is starting to work. Maybe he is starting to understand he can trot. I love this sport and you have to admire all these animals that participate.